Knitted Wire Mesh Mist Eliminator Manufacturer In India. We Have Developed Our Leading Position Through A Commitment To Customer Service, Technical Expertise, Product Innovation And A 'Can Do' Philosophy. Knitted Wire Mesh Mist Eliminators Are Sometimes Called Crinkled Wire Mesh Or Mesh Blankets. Laktas Has Manufactured Thick Pads Of Knitted Wire Mesh For Use In The Oil And Gas Industry Since 1990. Knitted Wire Mesh Is A Cost-Effective, Reliable Solution That Is Well Proven And It Continues To Be Used In Modern Equipment Designs Today. The Knitted Wire Media Provides Surface Area For Entrained Liquid Droplets To Strike, Adhere And Coalesce Into A Free Flowing Liquid Film Which Drains By Gravity. The Souders-Brown Equation, A Function Of Gas Velocity, Gas Density And Liquid Density, Is Used To Determine The Appropriate Flowing Velocity For A Given System. The Souders-Brown Equation Is: Where Vg = Design Gas Velocity K = Capacity Factor Pl = Liquid Density Pg = Gas Density The Capacity Factor Is Determined Through Experience And For Each Application. It Is Influenced By The Type And Style Of Mist Eliminator, The Relative Geometry Of Mist Eliminator To Vapor Flow, As Well As Process Considerations Such As Operating Pressure, Fluid Viscosities And Liquid Surface Tension. Typical Values Are 0.35 Ft/Sec For Vertical Flow And 0.42 Ft/Sec For Horizontal Flow, Assuming An Air Water System At Ambient Conditions. Demister Pad Is Also Call Mist Eliminator. Carryover Of Liquid Particulate Along With Gas Or Vapor Is Generally Termed As “ Mist” Or "Entrainment", Which Is Commonly Encountered In Gas-Liquid Separations. Mechanism Of Mist Eliminator / Demister Pad Mist Is A Generic Term For Entrainment, Where The Size Of Entrained Liquid Droplets Is Less Than 10um. When Mist Laden Vapors Passes Through The Knitted Wire Mesh The Vapors Moves Freely Through The Mesh But The Liquid Droplets, When Droplet Come In Contact With Knitted Mesh It Will Get Collected And They Collapse In Form Of Large Droplets Due To Gravity Force . Laktas wire mesh pvt Ltd is manufacturer, exporter, stockists, distributer of knitted wire mesh. Knitted wire mesh is mainly use in demister pad for oil and gas sepretion. CRITERIA FOR SELECTING TOWER PACKING Maximum void space. Lower pressure drop. Higher active surface area. Light weight & high strength. Higher efficiency(low HETP). More interstitial transfer point. Shaped to induce turbulence in bed. Higher liquid and gas distribution rate.. Minimum investment & low operational cost. Raschig Rings Raschig Rings Manufacturer In Mumbai , First Generation Random Packing, Are Normally Made From Metals Like Carbon Steel Or Very High Alloys Such As Monel 400 Or Hastelloy C276. Metal Rashig Rings Are Used In Specific Applications Demanding Good Corrosion And Thermal Transfer. They Are Generally Thicker Than Other Random Packing Types And Offer High Durability And Lower Efficiency Than Other Random Packing Types. This Durable Design Has High Crushing Strength And Long Life So Frequently Used Refinery And Gas Processing Industries. Raschig Rings Are Available In Variable Sizes Such As (Mm): 25, 38, And 50. Get Honeycomb Conveyor Belt In India. Laktas Wire Conveyor Belt Is Known One Of The Reputed Manufacturer, Exporter And Supplier Of Wire Mesh Belt In India. Manufacturer Of Conveyor Belt Type :- Honeycomb or Flat Wire Conveyor Belts Biscuit Conveyor Belt. Farsan Belt. Balance Weave Conveyor Belt. Chain Driven Conveyor Belt. Enrober Conveyor Belt. Honeycomb or Flat Wire Conveyor Belts Honeycomb Conveyor Belts Are Used In the Applications Such As Food Processing, Freezing, Baking, Drying, Painting, Cleaning, Transferring As Well As Parts Washing Etc. They Provide As Open Mesh For Easy Flow Of Air, Liquids Or Gases Through These Belts And Around The Products. The Most Important Features Of This Belts Are Flat Surface, Easily Cleanable And Easy To Replace The Parts Which Are Damaged. Honeycomb Conveyor Belts Are Available In High Carbon, Steel, Galvanizes, 304 Stainless Steel And 316 Stainless Steel. Manufacturer of Compound Balance Belt In India. Laktas Wire Mesh Is One Of The Leading Manufacturer & Exporter Of Conveyor Belt In India. Laktas Wire Conveyor Belts And Chain Belts Can Carry Light To Heavy Loads And Will Run Straight Without Guidance . Wire Conveyor Belt Types :- Compound Balance Belt. Lehr Belt. Balanced Weave Belt.. Chain Driven Belt. Duplex Conveyor Belt. Conveyor Belt With Side Guard . Enrober Conveyor Belt. Honeycomb Conveyor Belt. Balance Weave Conveyor Belt . Flat Wire Conveyor Belt . 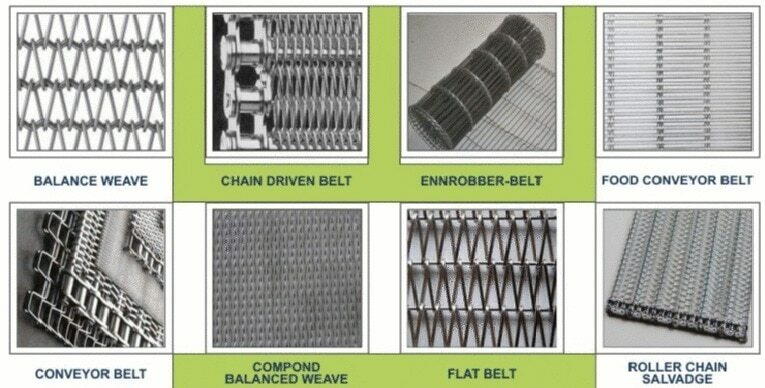 Compound Balanced Weave Belt :- Compound Balance Weave Conveyor Belts Are Very Closed, It Consists Of A Series Of Alternating Left-Hand And Right-Hand Spirals Fastened By A Straight Cross-Rod Connector. The Close Nesting Of The Spirals Makes This Belt Ideal For Carrying Very Small Parts, Such As Nuts, Bolts, Screws, Nails, Etc. The Compound Balanced Metal (Mesh) Belts Offer The Tightest Design Of Any Woven Wire Belt. It Is Mostly Used In Biscuits Industries, Such As Bakery And Baking Etc. The Architect Also Used This Belt For Making Curtains. Compound Balanced Belt Is Used In Following Industry:- BAKING. BAKERY. BISCUITS. TORTILLA. CRACKERS. HEAT TREATING. SMALL PART APPLICATIONS. Cord Weave Is Preferred By Bakeries Because It's Open Enough To Provide Even Heat Distribution And Passage Of Gases. Cord Weave Can Be Woven Of Flattened Wire To Provide A Surface That Minimizes Product Marking. It's Also Preferred When And Extremely Flat Surface Is Required. The Best Choice For Conveying Very Small Products And Top Heavy Loads. Baking Industry: For Cookie Baking, Tortilla Baking, Bakery Belts, Food Processing, Crackers, Biscuits And Popular With All Forms Of Continuous Baking Applications Of Baked Goods Including Cracker And Cookie Baking. Industrial Industry: Heat Treating Of Small Parts, Hardening, Tempering, Quenching. It's Great For Handling Small Parts In Heat Treating And Quench Tank Operations. The Smooth Surface Is Ideal For Transferring And Conveying Small Parts Drying.